Centre for Life Sciences (CeLS) also hosts several partner research institutes and research centres. They are NUS research institutes/centres, a few of which having collaborations with other institutes and universities both in Singapore and overseas. CIRC was established in 2007 as a joint venture between the Agency for Science, Technology and Research (A*STAR) and the National University of Singapore (NUS). CIRC undertakes and promotes research and development in the field of advanced clinical imaging in human subjects. It works closely with the Singapore Bioimaging Consortium (SBIC) that focuses on preclinical imaging in animals, thereby completing a translational pipeline of imaging research bridging preclinical and clinical outcomes. Click here to find out more on CIRC. CM provide professional and technical service for laboratory animal care and are dedicated to the promotion of animal welfare through compliance with the National Advisory Committee for Laboratory Animal Research (NACLAR) guidelines and AVA regulations pertaining to animals. CM are committed to the advancement of science in collaboration with the research community by promoting the humane care and use of animals used in biomedical research and teaching. CM oversees veterinary medical care, animal care services, and actively participates in research and training. CM has been accredited by the Association for Assessment and Accreditation of Laboratory Animal Care International (AAALAC) since 2010. For any enquiries, please email to lacsec@nus.edu.sg. A unique interdisciplinary Research Centre of Excellence (RCE). Hosted by NTU in partnership with NUS, SCELSE is linking new insights from the life sciences with expertise from the emerging technologies in engineering and natural sciences to understand, harness and control microbial biofilm communities. Click here to find out more on SCELSE. SINAPSE focus on Neurotechnologies for basic science, clinical application and commercialization. The field of Neurotechnology is ripe and poised for explosive advances and growth. This is possible, as never before, through understanding, treating, and utilizing the power of brain and nervous system through cutting edge technologies. The ambition of this initiative is to use advanced research partnership of engineers and scientists to develop neurotechnologies that offer the breakthrough potential: for scientific discovery, medical or defence needs and for commercialization and economic benefit. Click here to find out more on SINAPSE. 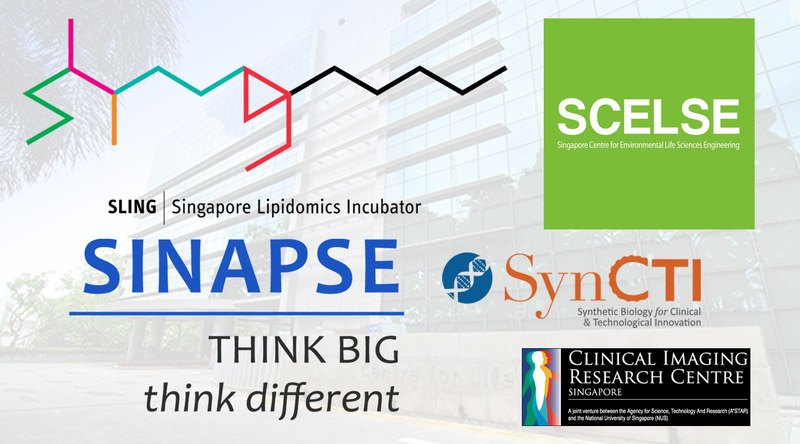 SynCTI was formally established in 2014 as the focal research program for Synthetic Biology at the National University of Singapore. SynCTI operates as a highly interdisciplinary research core that amalgamates researchers from multiple disciplinary fields, and closely interacts with other research programs within NUS, leveraging on existing research capabilities in synthetic biology that have been developed through funding from local and international organizations. Click here to find out more on SynCTI. SLING is a major global magnet for collaborating parties in lipidomics—from academia and industry—delivering new technologies and intellectual capital. Our centre offers cutting edge facilities and a diverse base of investigators and students, anchored at the National University of Singapore, a leading global University centred in Asia. Click here to find out more on SLING.